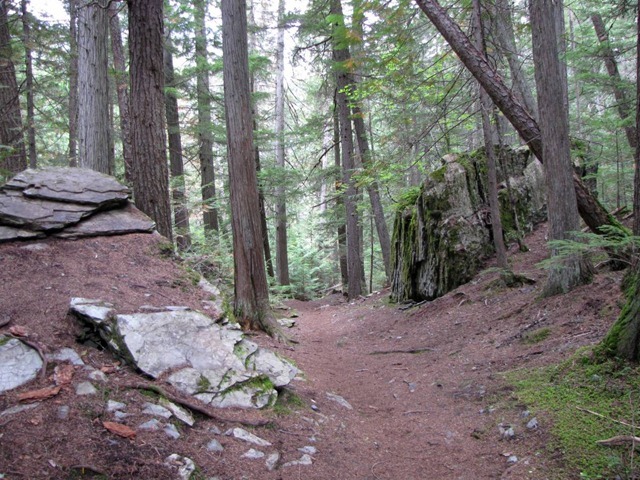 The Johns Lake Loop trail-head is located 1½ miles (2.4 KM) east of Lake McDonald Lodge on Going-to-the-Sun Road. Johns Lake is named for ‘Dutch’ John Elsner, a homesteader who owned a claim above Lake McDonald. The loop is about 3 miles (4.8 KM) long and begins through lush, old-growth forest of hemlock and cedar emerging from a floor of moss and ferns. Net elevation differential is 30 ft (9 m) so it is a pleasant walk nearly anyone can do on well signed, grand trail weaving through large trees, dead-fall and large, glacially-deposited rocks. The hike is an effort-worthy ½ mile to the swampy lakeshore where tiny Johns Lake offers still-water reflections of Stanton Mountain and Mount Vaught punctuated by lily pads along the shoreline. Johns Lake is a very beautiful and peaceful place. The trail continues around the small lake and back to a crossing past Going-to-the-Sun Road. Trail on the other side leads to a bridge over McDonald Creek and a sweeping view of the Sacred Dancing Cascade. The flat, cascading waterfall derives its name from an old Kootenai phrase meaning ‘a place for dancing’. Slab rock bordering McDonald Creek channels crystal-clear water through aquamarine pools and over shallow rock staircases. The idyllic river walk under the sun offers the ultimate in nature’s ability to promote relaxation. This gentle walk is an ideal precursor to lunch in the Fireside Dining Room at Lake McDonald Lodge in Glacier National Park, Montana, USA.